The concept of yin and yang is at the foundation of Chinese medicine theory. Yin and yang represent opposites, however they are complimentary to each other. They are interdependent of one another and transform into each other, yet maintaining a balance of yin and yang is important to maintaining good health. All physiological processes of the body are the result of the interdependence of yin and yang. In addition, it can be said that all disease signs and symptoms are the result of an imbalance of yin and yang. 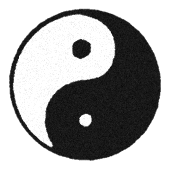 Yang relates to the sun, brightness, summer, fire and activity while yin relates to the moon, shade, winter, water and rest. As we move into the summer season full of expansion, activity and movement, make sure not to over work or overtax oneself and take time daily to rest and be in stillness in order to maintain balance of yin and yang. Too much yang can lead to a deficiency of the body's yin energy. Balance in our lives with diet, exercise, work, emotional life and sexual lives, is the essence of prevention in Chinese Medicine. Regular acupuncture treatments can also help to correct imbalances as well as maintain balance of the yin and yang energies of the body.